To properly understand what makes this system special, we need to take a small step back and remember two well-established ideas about galaxies: first, that every galaxy plays host to a SMBH, and second, that galaxies can merge to create bigger galaxies. By this simple logic, finding evidence for multiple SMBHs in the same galaxy might seem unsurprising. The trick is that most galaxy mergers happened in the distant past and far away, making it impossible to directly distinguish multiple SMBHs at such close separations, and difficult to pin down the signatures of a recent SMBH merger. Conversely, in the local universe, this is less of a problem, but galaxy mergers are rare. CID-42, a relatively nearby object, is the first potentially interacting SMBH system that we have been able to study in detail, and, consequently, it has revealed some unfamiliar features. Figure 1: An optical image of CID-42 from the Hubble Space Telescope ACS, with the northwest (slightly extended) and southeast (point-like) components labeled - east is to the left. Image taken from an earlier study by Civano et al. 2010. Seek and ye shall find: is this the signature of a binary SMBH merger? A few years ago, Civano et al. set out to look for SMBHs that had been displaced from their galaxy centers by a kick from a gravitational wave. Numerical simulations and general relativistic theory predict that such a recoil should occur when two SMBHs become one, and, depending on the spins and masses of the black holes, could perhaps even be strong enough to eject the newly-formed SMBH from the galaxy. Because SMBHs are easier to detect when they are actively accreting material and therefore emitting x-rays, the authors chose to examine the optical images of galaxies that are known to be bright in the x-ray. This didn’t narrow things down too much, leaving them 2600 sources to sift through in the huge Chandra– and XMM–COSMOS fields; nonetheless, CID-42 was the only candidate they found. The optical image shown in Figure 1 depicts two compact regions within a disturbed host galaxy with a lopsided tidal tail, consistent with the idea that is has undergone a recent merger. Modeling reveals that the northwest (NW) component is slightly extended, while the southeast (SE) component is too small to resolve. 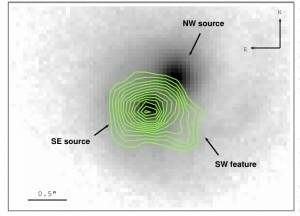 Because of the high energy emission we see, we expect at least one of these sources to be a compact, accreting SMBH which would appear as a point source: the SE component. More specifically, there are broad hydrogen emission lines, it seems that the SE component is an unobscured (type 1) active galactic nucleus or AGN, which allows us to see the fast-moving material close to the black hole (see this astrobite for an overview of AGN). The nature of the NW component, on the other hand, is less clear. If the original picture is correct, the NW component is likely to be the nucleus of the galaxy from whence the SMBH was ejected. Alternatively, the NW component could itself be a SMBH resulting from the coalescence of the heavier two SMBHs in the system. Constrained by the observations, this SMBH would be highly obscured by donut-shaped dust cloud – a type 2 AGN. In order to distinguish between these scenarios, the authors obtained high-resolution x-ray images from Chandra, allowing them to pinpoint exactly where the x-ray emission originates from. As shown in Figure 2, the NW source doesn’t appear to be generating x-rays, implying that it is either extremely dusty, or not an AGN. It is improbable, though not impossible, that an AGN would be so heavily obscured, and modeling of the distribution of the observed optical light (the spectral energy distribution or SED) favors the case where the NW component is a young, star-forming region. Thus, for the moment, let’s consider the remaining characteristics in the context of a binary SMBH merger, and return to the second case later on. Figure 2: Chandra high-resolution x-ray emission contours are shown in green, overlayed on the greyscale optical image. A newly discovered x-ray component to the southwest is of unknown origin, and could be related to star formation or ionization by the AGN. Now that we have established the spatial characteristics of CID-42, it’s time to think about spectroscopy. The various emission and absorption lines around an AGN can tell us about the velocities of the responsible gas relative to us through their Doppler shift: if the lines are bluer than we expect, the gas is coming towards us, and if redder, it is moving away from us. Here, the narrow emission lines, thought to originate farther from the AGN where the gas is cooler, have a different Doppler shift than the broad emission lines, and imply that the two regions are flying away from each other at ~1000 km/s. A possible explanation for this is that the traveling AGN can only carry away the material that is closest to it, leaving behind its more extended regions. This again highlights how lucky we could be to observe such an object, since an ejected AGN will run out of material to accrete and become quiescent in 1-10 Myr (short by astronomical standards), and at which point it would be much harder to detect. In addition, there is the strange observation of a strong, redshifted iron absorption line from the AGN. In almost all cases, iron absorption lines are blueshifted, and thought to trace winds or outflows that are being pushed away from the SMBH. In order to get a redshifted iron emission line, the reverse must be true: material must be falling directly into the black hole, and at relativistic speeds. Direct infall is only expected in extreme situations; few other candidates for this effect have ever been seen. Figure 3: Schematic representation of the binary AGN system, where a third SMBH has already been kicked out of the galaxy. 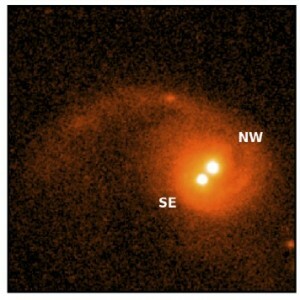 An alternative scenario to the binary SMBH merger is a triple SMBH interaction (implying a three-galaxy merger), where the NW source is in fact an obscured AGN resulting from the merger of two SMBHs. The slingshot effect of the third SMBH entering the system would be enough to propel the SE, unobscured AGN, which is associated with the broad line emission, away from the NW, obscured AGN, which would now be responsible for the bulk of the narrow line emission. Here, the redshifted iron absorption line could come from an outflow of the obscured, type 2 AGN, which is illuminated by the unobscured, type 1 AGN as shown by the cartoon in Figure 3. 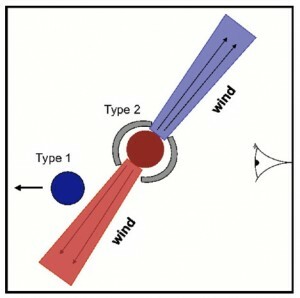 These large-scale winds are proposed to be ubiquitous for AGN, but they have not yet been detected for a type 2 AGN, perhaps because they are normally too faint. Although current evidence suggests that the setup is less likely for CID-42, if it were correct, it would provide the first opportunity to test the theory that these winds can be found in all AGN types. CID-42 is incredibly rich in interesting phenomena, regardless of which explanation is ultimately the best. It seems most likely that we are seeing the result of a binary SMBH merger recoiling from strong gravitational wave emission, but future observations at high spatial resolution will allow astronomers to settle this question more definitively. Either way, it should give extragalactic astronomers a new and unique insight into the nature of SMBH mergers, illuminating a subject that has rarely been pursued through direct observation. I like to know where to find the optical image of CID-42 in Fits data format. Please give me a hind. I would suggest that you start by looking in the Civano + 2010 paper, as that gives more details about the observations. In particular, you can look up the full object name (CXOC…. ), the telescope (HST), the camera (ACS – Advanced Camera for Surveys), and the filter (F814W, i.e. 814 nm, wide). Since this is Hubble data, you can search for the object in the MAST archive and, assuming the data are now public, download the FITS files from there. Alternatively, you can shortcut the search process by following the link on the right hand side of the ADS listing (the first link here) under “Data products > Archival data”. I cannot find the (original-) ACS fits image. I found some on Mast Archive and the HLA, but this ones doesn´t fit to my impression. I exspect an fits image with visible two cores in the Galaxy without further ado. I am wrong? You should be able to see the two cores without a problem in the ACS image from MAST (and HLA as well); I suspect the issue is in finding the right image. Try looking up the coordinates in SIMBAD directly, then do an image search with a smaller radius (under “more options” in MAST) so you have less options to choose from. I can see it in the dataset “JBOA07020”; however, you will probably want to download the image and view it in DS9 (which you can download for free here) if you want control over the image settings. In DS9 you can set a logarithmic scale, change the range to something like min/max, adjust the colorbar, orient the image so that north is up (zoom > align), etc. You can also check the coordinates in the information panel to make sure you are looking at the right object. Those things should make it more obvious that you’re seeing the same image as in the paper.